Acing a job interview can give job seekers a huge dose of optimism. However, no matter how well you got along with the hiring manager, there is still work to be done to ensure you got the job. Don’t let another candidate swoop in to secure the position because you didn’t follow proper protocol for following up after an interview. Follow these tips to learn how to make an impression after a job interview and seal the deal. Your mother was right when she said to always send a thank-you note, and a job interview is no exception. While a handwritten note is still acceptable, most career professionals agree that an email is more common. Whichever method you choose, send it within 24 hours of completing the interview and send one to each person that you interviewed with. If you can’t find an address for a certain individual, ask one of the other interviewers to pass along your thanks. Make sure that you spell each person’s name correctly and that you use their proper title. Treat the letter as a business document, even if you got along well on a personal level. Make sure to reference specific topics that you talked about during the interview to make it more personal. Finally, reiterate that you are still very interested in the position. Another way to further impress the interviewer is to include additional samples of your work or articles that relate to what you discussed. 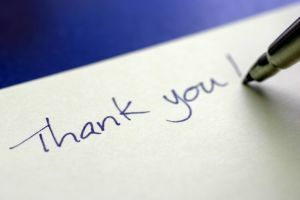 Thank-you notes also give you an opportunity to counteract any negative aspects of the interview. For example, if you left out one of your important skills or didn’t thoroughly explain something, use the thank-you letter to expand on it. If the company asked you to send references, documents or complete other paperwork do so as soon as possible. In fact, if you have these items in electronic form, attach them to the thank-you email. These items are critical to completing in the hiring process, and the company may not move you to the next interview without them. Job candidates want to stay informed on their status of getting a job, but how you do it can actually cause you to lose the job. First, if the company specified a method for communications, such as email, only use that method. In addition, don’t follow up until the stated amount of time has passed. If they indicated it could take up to two weeks for a decision, wait until after the full two weeks before calling or emailing. If they didn’t specify a time period, wait at least seven days. If you call or email the company twice with no response, move on to another job lead. It doesn’t mean that you won’t get the job, but no response is usually an indication that you aren’t at the top of their candidate list. Whatever you do, don’t repeatedly attempt to contact the company. This is the quickest way to kill any chances you have of getting the position or future ones. Sometimes the hiring process takes months to complete, and the company representative may simply not have an update for you, yet. Turning into a stalker will make the company hesitant to turn you into a full-time employee. While you’re waiting, it’s the perfect time to call in any favors if you know someone who works at the company, previously worked at the company or knows the hiring manager. Have them contact the manager and put in a good word for you. Note that this only works if they know the person well. Don’t just have your standard references make phone calls to the company if they don’t know the individuals personally. Sometimes the best way to make a good impression is to not make a bad one. One area where many job seekers commit a faux pas is social media. Don’t post anything about the interview on any of your social media accounts, even if it is good. Sometimes companies like to keep jobs under wraps, and they may not appreciate you advertising it. In addition, don’t immediately try to connect with all of the interviewers on LinkedIn. You haven’t established a solid relationship with them yet, and it will seem pushy. As soon as you leave the first interview, start preparing for the second interview. Research any topics that you discussed in the first interview to learn more about them. Look up key personnel that you met by viewing their LinkedIn accounts and other public profiles. Read through the company’s website and social networking pages again to find something you can work into the conversation. Recent product announcements or charitable giving announcements are always good topics to discuss. You may want to set up a Google alert for the company and the interviewers too. That way, you will get a notification anytime they are mentioned in the news or online. This is a great way to stay informed about what is happening at the company. Learning how to make an impression after a job interview is really just about following proper business etiquette. While you may not get the job, you will impress them with your professionalism which can lead to another position later. Whether you live in Michigan or around the country, the employment experts at Vertical Media Solutions can guide you toward a successful career move. 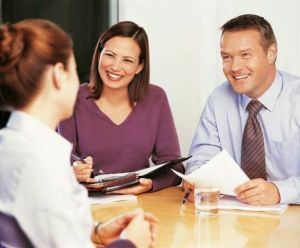 Our personalized career coaching services help you tactfully navigate the interview process. Learn how we can help today: 616-631-4300.